People are always asking me how to make curry. At first, I was surprised the news was out that I’m such a great cook. And the people asking usually really want to know how to make it ‘authentic.’ Authentic what? The word “curry” itself is an anglicisation and not ‘authentic’. But I’ve come to accept it’s less about my culinary skills or my knowledge of South Asian cuisine. What it tells me is that you do see the colour of my skin. I have brown skin. My parents were both migrants of Indian descent, growing up in countries formerly part of the British empire. I usually tick that Asian Indian box in diversity forms (is it the right one, who knows?). I’m used to my race being front and centre of people’s minds, even if they don’t comment on it. They can’t help it – I’m so brown and they’re often so white. But I’m more than the colour of my skin and I too hold privilege; I’m able-bodied, heterosexual, grew up in the South of England and economically secure. What I find most challenging is how uncomfortable people are talking about race. I can see those chatting to me trying so hard to ignore my brownness, hoping that by not acknowledging it, they’ll avoid saying something I might find racist. Instead, they talk around it. “How do you make a curry?” or another favourite: “Where are you really from?” straight after meeting me. But they don’t really mean where I’m from (Hertfordshire). They mean, “you look too brown to be English, so I need to know where your parents were born” – even though they’ve never met them. I’m fully aware, like many people of colour, LGBT people and disabled people, that there is only so much “diversity chat” people with privilege will tolerate, especially at work. We become adept at biting down. “Pick your battle” is my mantra for navigating white-dominated spaces. But this isn’t because I don’t want to have the conversation. It’s because I know how uncomfortable the conversation of race makes other white people. I know there are people who will be able to relate. In the third sector, it’s clear we have an issue addressing race too. The sector has long been criticised for being too male, pale and stale. Progress is happening but it’s slow.That’s why acknowledging the challenge, and communicating a path to change, with practical commitments will make the most significant difference today, while diversity and inclusion programmes take time to show their full effect. More and more people are calling for radical change. Addressing the Institute of Fundraising convention this year, fundraising consultant and former chair of Black Fundraisers UK, Carol Akiwumi told delegates to “get out of your comfort zone” and implement effective diversity strategies in order to find ways of “getting comfortable” with new and different perspectives and ideas. If we don’t act soon, underrepresented people will continue to leave the third sector behind, disillusioned by the gaslighting and failure to listen to their concerns, making it harder to build a diverse and capable workforce. If you talk about race, are you a racist? The fear of being branded racist is preventing healthy debate. And in turn, that fear is stifling the people who would most benefit from open conversations. 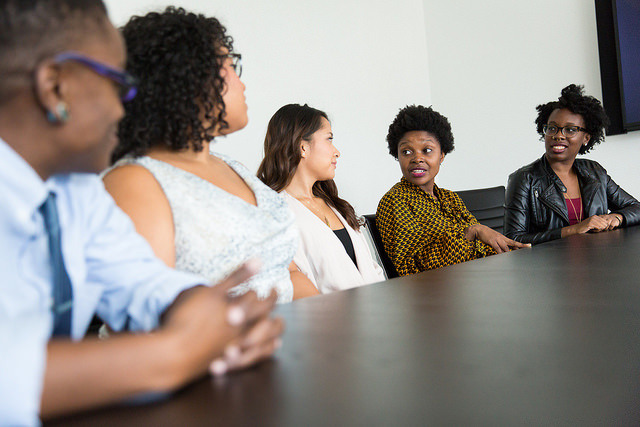 Without open and frank conversations, we’re never going to be able to get comfortable talking about race – a foundational part of crafting solutions to improve racial diversity in the sector. We need to accept we’ll be called out for our privilege, it will be uncomfortable, and we need to stare our own unconscious bias in the face. If we really want to tackle the lack of diverse voices in the third sector, we need to find a way of having inclusive conversations about identity. Having conversations doesn’t mean talking down to people but begins with active listening. The first step is finding out about the power dynamics our current social structures are built on by consuming the relevant content. It’ll also give you the right vocabulary, as well as clue you up on the topical issues and debates which will mean you’re talking from a position of knowledge and understanding when the opportunity arises. If you’re interested, this is my passion project. I’ve tweeted a thread of interesting content on race, identity, and power to get started. And if you do nothing else, the podcast series (Seeing White) from Scene on Radio is a fascinating breakdown of the origins of white culture in the USA, particularly analysing the history of whiteness and its construction to assert control. This final episode is focused on how to have productive conversations about race with people of colour. We need to stop the myth that talking about race, sexuality, disability or anything that makes us uncomfortable is a bad thing. Instead, it’s about how those power structures are baked into our society. The more we talk about it, the more we can address it, tackle it and find better solutions. These views are personal and do not necessarily reflect the views of CharityComms. Want to know more? CharityComms ran a seminar on diversity and the slides are available here.